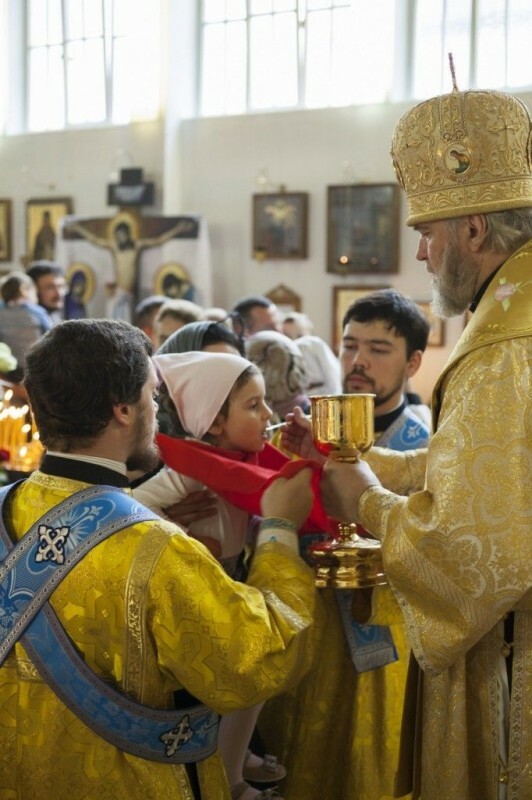 On 12 October 2014, celebrations marking the 20th anniversary of the foundation of the Parish of the Holy Martyrs Valentine and Pasicratus in Ulm (Germany) took place at the Church of the Kursk Root Icon of the Mother God “Of the Sign”. Metropolitan German of Kursk and Rylsk and Archbishop Feofan of Berlin and Germany celebrated the Divine Liturgy on this festal occasion. Concelebrating with them were clerics of the diocese of Berlin and Germany and guests from Russia, Ukraine, Belarus, and Spain, the website of the diocese of Berlin and Germany reports. A reception on behalf of the parish council was given after the service. Among those who attended it were Mr. Ivo Gönner, Lord Mayor of Ulm, and representatives of various Christian confessions. Hegumen Maxim (Schmidt), rector of the Ulm parish, greeted all those present and told them what the community had achieved for these 20 years. The guests were shown icons and other works by Dimitri Hartung, an icon painter from Stuttgart, and handmade articles by pupils of the parish Sunday school. Numerous guests made commemorative entries in the parish guest book.